 Log In needed 32" HITACHI TV & ROLLING STAND - free! 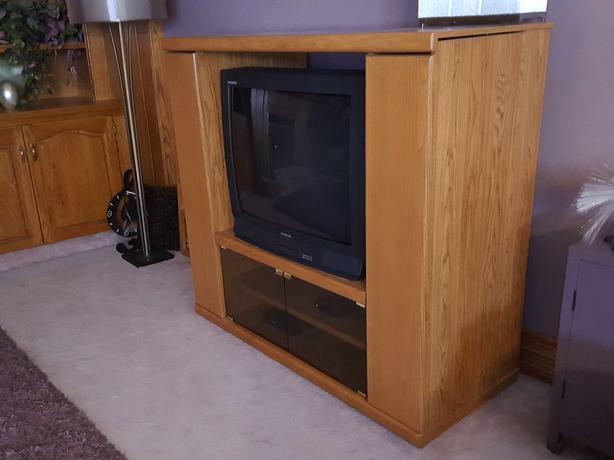 Free 32" tube TV & stand, bought new by me at SEARS in 1998. Very reliable TV - never had to fix anything on it and it still works properly and I'm using it! TV weighs 120 lb. It's 26 7/17" high, 30 15/16" wide and 23 3//8" deep. Screen measures 32" on the diagonal. Has front inputs for your DVD; see the photos. Owners manual and remote controller included. The remote's battery cover is missing but I'll look for it. It works w/o a cover, and in any case, you wouldn't be using this remote if you have cable or satellite TV. Easy-to-move natural oak-look stand on rollers. Has hidden storage shelves on both sides. For a different look, you could remove the side storage shelves if you wanted. It is 54" wide, 23" deep and 49.5" high. The TV's shelf is 22" deep and 35" wide. Bottom shelf has some scratches, which could be covered by your equipment. There is also a backer board for the stand (not shown) which is included. Pickup in Wascana View. TV and stand are free, but I ask that you use a mutually acceptable commercial mover to take them out of my house. Gref's is one mover who would be fine by me.